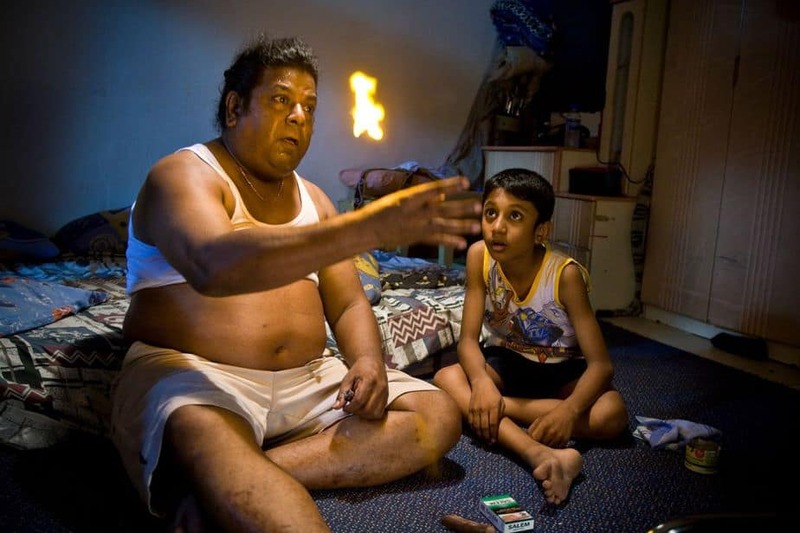 “My Magic” remains the only movie from Singapore to be nominated for the Palme D’Or, while It was also selected as Singapore’s official entry for the Oscars in 2009. Khoo casted Tamil actors, a minority in Singapore, in a rarity for local cinema, while Francis Bosco, the protagonist, is a real life magician. Lastly, the film was shot in just 9 days, and most of Bosco’s stunts were done in one take, since Khoo was afraid he would be injured, while the music of the film is courtesy of his then 10-year-old son, Christopher. During the 2008 Cannes Festival, Eric Khoo stated that he wanted to shoot a film about the relationship of father and son, which led a number of reviewers to criticize the film for the (under) development of this relationship. However, in my opinion, and although this relationship is one of the main themes of the movie, the actual focus is Francis Bosco, with the film functioning as a tribute to this extraordinary man, who continued to perform his chilling routine until last year, at the age of 70. This aspect becomes obvious from the introductory scene, as we watch Francis eating the glass he was drinking whiskey from, while the plethora of lengthy scenes where he performs his blood-chilling “tricks” also point towards this direction. In that fashion, the turn towards exploitation the film takes just before the finale seems like the most natural path, with the grotesque torture scenes and particularly the last one with Francis’s boss being meaningful, as they are shocking. At the same time, these scenes also establish the distance the father is willing to take for his child, thus justifying the conciliatory aspect of the ending. Keng Yew Seet as the big boss, Jason Lim as the bar owner and Sunny Pang as one of the tortures are great picks for their roles, with their villainy benefiting the most from their physical appearance. Adrian Tan’s cinematography finds its apogee in those scenes and the ones Francis is performing, with the darkness that seems to be everywhere, both literally and metaphorically, being interrupted only from his fire tricks. Lionel Chok’s editing gives a relatively slow pace to the film, in art-house fashion, although the performance and the torture sequences proceed quite rapidly, with the change of pace benefitting the entertainment aspect of the film. Khoo’s almost slapstick sense of humor also moves towards this entertaining direction, with the few funny moments (the wallet on fire and the way the son manages to avoid getting beaten are distinct samples) providing a very fitting relief from the drama and the violence. The relationship between father and son benefits the most from the acting of the two protagonists, with little Jathisweran as the son giving a very natural performance as the child that has to grow up beyond his age, with the scenes he criticizes his father being the highlight of his performance. Their chemistry with Francis Bosco, who plays the loser who tries to change for the sake of his son, is great and also benefits much from their difference in physique. “My Magic” is an impressive film that manages to combine elements of drama and exploitation in the best way, and a great tribute to a truly unique man.